The Ocean Beach, California-based band formed by multi-instrumentalists Kyle McDonald and Miles Doughty has matured into a versatile musical ensemble consisting of drummer Ryan “Rymo” Moran; percussionist Oguer “OG” Ocon; saxophonist Daniel “Dela” Delacruz; keyboardist Paul Wolstencroft; trumpet and trombone player Andy Geib, and an arsenal of guests that frequent the stage, most notably Karl Denson (Rolling Stones/Greyboy Allstars), Don Carlos, Chali 2na (Jurassic 5) and Rashawn Ross (Dave Matthews Band). The band’s prolific 2017 schedule has included international shows in South America, Australia, England and the Netherlands, in addition to the 30+ national headlining dates that encompassed the band’s annual outdoor amphitheater tour, titled “Sounds Of Summer 2017,” ranking in Pollstar’s Top 100 Global Tours of Summer 2017. In December 2017, the genre-mashing outfit will host its 4th annual Closer To The Sun festival, a four day gathering of music in an intimate “all inclusive” setting for their hardest core fans and favorite hand selected talent, taking place on the sand in Puerto Morelos, Mexico, amidst the spiritual Mayan Peninsula. The Closer To The Sun festival also represents Slightly Stoopid’s philanthropic side, as the event helps to raise funds for the non-profit charity, Positive Legacy. Additionally, Slightly Stoopid has generously supported the pediatric cancer organizations Grind For Life and the Sheckler Foundation by teaming with the legendary skateboarder Danny Way for a limited edition custom skate deck/CD fundraising project. Also, the 2017 animated video for their recent single “One Bright Day” (featuring singer Angela Hunte), included an “on-line auction” component utilizing limited edition hand- painted canvases used in the video. The effort helped to provide light to 4 villages associated with the Global Brightlight Foundation, a charitable organization for providing third world villages in need of solar power. Recently Slightly Stoopid also churned out its second live webcast performance with music legend Bob Weir (Grateful Dead) at his TRI Studios complex, a session that yielded live versions of Grateful Dead’s “Franklin’s Tower” and Prince’s “Purple Rain” (the latter recorded at the respectful request of Weir on the morning that witnessed the legend’s unanticipated passing). Slightly Stoopid is pleased to announce the the initial dates for their School’s Out For Summer 2018 Tour with special guests Stick Figure and Pepper. The tour will bring the band across the country making stops in cities coast to coast as well as headlining festival appearances at Levitate Music & Arts Festival and Arise Music Festival along the way. Chali 2na (Jurassic 5), G. Love and more! Slightly Stoopid will release their 9th studio album Everyday Life, Everyday People on Friday, July 13. Album pre-orders begin on Friday, May 11. The first single off the record “If You Want It”, is available now on all DSPs, plus all pre-order album purchases include an instant download of “If You Want It.” Pre-order the album here! Slightly Stoopid inspires a collective and community based atmosphere conducive to everyday life, as well as their art. Embracing the art of collaboration, the band is often joined by an arsenal of guests both on stage and in the studio. Special guest appearances on this LP include Ali Campbell (UB40),Alborosie, G. Love, Chali 2na (Jurassic 5), Don Carlos, Yellowman, Sly Dunbar (Sly and Robbie) and more. Everyday Life, Everyday People was inspired by the band’s hometown, Ocean Beach/San Diego, CA. To bring the vibe of their hometown visually, the band worked with friend and renowned artist Jay Alders who hand painted the cover art for Everyday Life, Everyday People. Alders is widely known for his surf art paintings. Everyday Life, Everyday People was recorded at various studios across the world in San Diego, CA, Los Angeles, CA, Kingston, Jamaica, Long Beach, CA, New York, NY, and Miami, FL. It was produced bySlightly Stoopid, James M. Wisner, George Spits (LlamaBeats), Michael “Miguel” Happoldt, Jerry Wonda, Colin “Bulby” York. In 2017, Slightly Stoopid’s annual outdoor amphitheater tour, titled “Sounds Of Summer 2017,” ranked 67th in Pollstar’s Top 100 Global Tours. In 2018, Slightly Stoopid will bring their high energy show across the country with the “School’s Out For Summer Tour” featuring special guests Stick Figure andPepper. The tour will bring the band across the country making stops in cities coast to coast as well as festival appearances at Hangout, Summer Camp, Cali Roots, Summerfest, Levitate Music & Arts Festival and Arise Music Festival along the way. Slightly Stoopid and Cloud 9 Adventures have announced the return of Closer to the Sun, an all-inclusive tropical destination concert vacation held over four nights fromNovember 30-December 4, 2018. Host band Slightly Stoopid with special guests will perform three full shows, with fan-favorite artists Stick Figure and Pepper performing two shows each. Michael Franti & Spearhead and G. Love & Special Sauce will both be performing two shows, including one acoustic set. Reggae legends UB40 feat. Ali Campbell, Astro & Mickey, plus Thievery Corporation, Alborosie, The Expendables,HIRIE, and The Movement are also joining the party. Venturing into its fifth year, the event has changed venues and is heading to the beautifulHard Rock Hotel Riviera Maya in Puerto Aventuras, Mexico while still maintaining the intimacy that Closer to the Sun fans have come to know and love. The event continues to prove an amazing experience for guests and artists alike, as performances are scheduled across a variety of unique venues – a main stage in front of the Caribbean Sea, beachfront sunset shows, and late night parties – all within easy walking distance to all-inclusive suites and amenities. This unforgettable experience extends way beyond the music, bringing artists and fans together in a close-knit community in paradise. From poolside games, daily yoga, and casual artist interactions to theme nights, Closer to the Sun curates the ultimate experience. Fans will also have access to Woodward – with indoor skate boarding & BMX biking, trampolines, foam pit, indoor ski & snowboard equipment, Ninja obstacle course, and more. Guests also have the opportunity to book select off-site excursionsthrough the event to explore the beauty and culture of the surrounding Mayan region extending from Cancun to Tulum. Hard Rock Hotel Riviera Maya is a luxurious all-inclusive resort located between Playa del Carmen and Tulum with all meals, beverages, concerts, and activities included in the event package price. The Hard Rock offers a wide variety of room selections, including oceanfront rooms and stagefront suites plus a multitude of dining options and unlimited drinks at bars throughout the property and concert area, all surrounded by lush grounds and sparkling blue pools. The resort also offers complimentary 24-hour room service, a world-class spa, salon, and fully equipped fitness center. All-inclusive packages for returning Closer to the Sun guests can be booked during thePre-sale on Wednesday, May 30th. Following the Pre-sale, there will be a Public On Sale beginning Thursday, May 31st at 12pm ET at www.closertothesun.com. Today, Slightly Stoopid release “Higher Now” featuring Chali 2na, the new single from the forthcoming album Everyday Life, Everyday People (out July 13). Slightly Stoopid is coming off a busy week of festivals and parties. Stoopid played packed shows at Hangout Music Festival, Summercamp Music Festival and California Roots Festival. In addition to the festival shows, the band had the privilege of playing at Tommy Chong’s 80th birthday party in LA. Slightly Stoopid will kick off their “School’s Out For Summer” 2018 tour on June 7 at the Kettlehouse Amphitheater in Bonner, Montana. In 2017, Slightly Stoopid’s annual outdoor amphitheater tour, titled “Sounds Of Summer 2017,” ranked 67th in Pollstar’s Top 100 Global Tours of 2017. This year Slightly Stoopidwill bring their high intensity show across the country with the School’s Out For Summer Tour featuring special guests Stick Figure and Pepper. The tour will bring the band across the country making stops in cities coast to coast as well as headlining festival appearances at Summerfest, Levitate Music & Arts Festival and Arise Music Festivalalong the way. Keep up with Slightly Stoopid at SlightlyStoopid.com. Everyday Life, Everyday People Out Now! Today, Slightly Stoopid release their highly anticipated 9th studio album Everyday Life, Everyday People. Slightly Stoopid inspires a collective and community based atmosphere conducive to everyday life, and embedded in their craft. Embracing the art of collaboration, the band is often joined by an arsenal of guests both on stage and in the studio. Special guest appearances on this LP include Ali Campbell (UB40), Alborosie, G. Love, Chali 2na(Jurassic 5), Don Carlos, Yellowman, Sly Dunbar (Sly and Robbie) and more. Everyday Life, Everyday People was recorded at various studios across the world in San Diego, CA, Los Angeles, CA, Kingston, Jamaica, Long Beach, CA, New York, NY, and Miami, FL. It was produced bySlightly Stoopid, James M. Wisner, George Spits (LlamaBeats), Michael “Miguel” Happoldt, Jerry Wonda, and Colin “Bulby” York. For the second year in a row, Slightly Stoopid’s annual outdoor amphitheater tour ranked in Pollstar’s Top 100 Global Tours. The tour has brought the band across the country making countless packed and sold out stops in cities coast to coast as well as festival appearances at Hangout, Summer Camp, Cali Roots, Summerfest, Levitate Music & Arts Festival and Arise Music Festival along the way. The Ocean Beach, California-based band formed by multi-instrumentalists Kyle McDonald and Miles Doughty has matured into a versatile musical ensemble. Band members consist of drummer Ryan “Rymo” Moran; percussionist Oguer “OG” Ocon; saxophonist Daniel “Dela” Delacruz; keyboardist Paul Wolstencroft; trumpet and trombone player Andy Geib. Slightly Stoopid will head out on their “Just Passing Through” fall tour this November, kicking things off in Minneapolis. The tour will bring them through the Midwest, Southeast and East Coast before the band heads out to their 5th annual “Closer to the Sun” all inclusive tropical concert vacation in Mexico. Slightly Stoopid announce their annual summer amphitheater tour, with this years installment: “How I Spent My Summer Vacation 2019”. 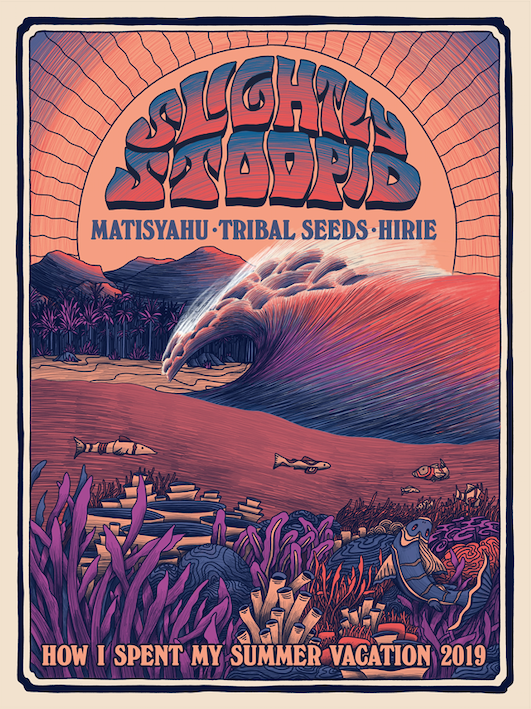 This summer, Slightly Stoopid will bring along special guests Matisyahu, Tribal Seeds and HIRIE. 2019’s North American route will take the band on 28 stops from California’s Pacific Ocean across the Atlantic seaboard, with additional dates to be announced including stops in Europe. Two decades into the process, Ocean Beach San Diego natives, Slightly Stoopid, have created a lifestyle movement of die-hard “Stoopidheads” and a catalogue of musical work that reflects their influences musically and socially. For more information, and to keep up to date with all Slightly Stoopid news, please visitslightlystoopid.com. ADDITIONAL TOUR DATES TO BE ANNOUNCED! The story of Slightly Stoopid, at its core, is one of brotherhood. It’s the story of Miles Doughty and Kyle McDonald, two musicians determined to succeed on their own terms, creating a multi-genre fusion of rock, reggae and blues with hip-hop, funk, American folk, metal, and punk. It’s the story of a duo that has not just survived, but thrived, as best buds- “brothers from other mothers”- true to their authenticity, through two decades of relentless touring, and evolving songwriting, repeatedly creating lasting artistic statements despite a music industry that too often prioritizes style over substance. Slightly Stoopid is and continues to be a musical family that always welcomes guest musicians and the art of collaboration. Doughty and McDonald remain unwavering in their principles of independence, honoring their diversity of influences and mentors, and furthering their inherited legacy of the Southern California sound.